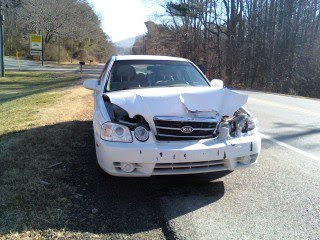 Two days ago, I wrecked a car for the first time in my life. Sure, my little white car has suffered a few bumps and scrapes, and flat tires, but I've never actually broken it quite like I did this week. The bright side is that my son and I walked away from the accident unhurt, as did the passengers of the truck in front of me. I remember trying so hard to stop, pushing my foot on the brake pedal even when I knew I wasn't going to avoid the crash. And then it happens, and it's done. My first thought wasn't "Thank you, God, we're okay." It was "Crap. What have I done now?" How quickly I allowed myself to feel discouraged and defeated by one mistake. This is not what God wants for us. The next morning when I was journaling, I took a good look at my attitudes and actions. I certainly see how blessed my life is with healthy relationships, more than the basic necessities, entertainment, opportunity, and a lot of extra stuff. And while I'm thankful for all that I have, I don't think I truly exhibit that gratefulness every day. Do I show my family how much I appreciate them, or do I just go through the motions of housework and scheduling? How do I show God that I am not someone that wastes resources and opportunties? Instead of complaining about what has to be done every day, I should be deeply thankful that I have been given so much responsibility so that I am able to share with others. Yet I am as broken as my car. It's difficult for me to see things clearly the way God does. I repeat "Not right now. Just a minute. I'm busy" too often with the kids because my mind is on a million different things I have to do. I don't kneel down enough to listen, laugh, and play without being distracted by the next item on my to-do- list. I unnecessarily get overwhelmed by those very tasks, when I should feel excited to accomplish things that bless others-especially my family. And if it's stealing precious minutes from them, it isn't important enough. I am so grateful for God's grace. I'm daily surprised by it. It's most often displayed by my very own husband. I tell him all the time that I don't deserve him, and I have no idea why he puts up with a mess like me. But he does. I love him for that. My friend was reminding me yesterday that God is just like that. We don't deserve His grace and forgiveness-his second, third, fourth, and thousandth chances. But He gives them to us, because He loves us. He loves us. Broken or not.